For the last four years the Community Foundation has worked to reinvent the scholarship – first with the Come Home Award and then with the Complete Your Degree (CYD) success program. No more is it just writing a check in the fall with wishes for the best of luck, CYD is an all-encompassing effort to help people prosper in their post-secondary education at St. Clair County Community College. Not only does it cover tuition and books, the program also addresses obstacles many students struggle with like food, transportation, housing and childcare. 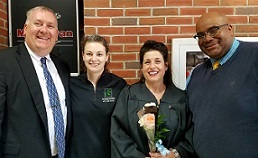 Sherry Graham is the first program graduate. On May 4, she earned her Registered Nursing degree from SC4. The college’s most challenging program, Graham was unable to work full-time during her studies and struggled to pay rent and buy groceries. CYD helped her cover those costs so she could pursue her dream career. Learn more about Graham and her experience with CYD in this The Keel article. Graham is one of 34 current participants in the CYD program. Current CYD beneficiary Mia Sutherland is a young mother who wants to give back to other children by pursuing a degree in counseling or social work. She is also joined by the latest program recipient, Laura Burrell, a retiree who has never earned a college degree and wants to challenge herself to be better. She symbolizes a passion for lifelong learning and will be an excellent role model for younger students in the classroom. Read more about Sutherland, Burrell and Graham in this Times Herald article. The Foundation and its partners such as St. Clair County Community College and the Ralph C. Wilson Jr. Foundation recognize the growing and challenging needs to help young adults overcome life’s obstacles to succeed in college.